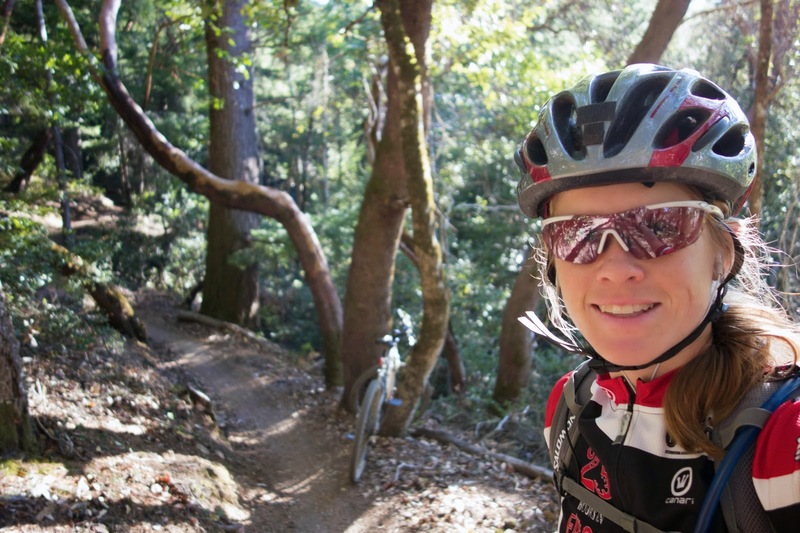 Mountain biking singletrack in the California sun. Okay, I did miss it. I'm far behind with my training log, so I'm attempting to catch it up here will the workout-specific notes that I wanted to record. Most likely only interesting to me, but then again what is a blog for? Monday, Dec. 16: Zero. Somewhat forced rest day after running 66 miles over the weekend. As often happens after big mileage push, I was still buzzing with endorphins and wanted to get back out there. This whole week was intended to be an easier week, to rest up and prepare for Alaska the following week. I'm hitting more of a stride with distance running in general. No physical issues from the weekend. Tuesday, Dec. 17: Run, 1:07, 7.3 miles, 659 feet climbing. Average pace 9:15 min/mile. I do all of my runs based on feel, so it's interesting to see which random routine trail runs generate a faster pace. I tend to perform better after rest days, who knew? Not that it makes any difference over the haul of a seven-plus-day effort. Strength is something I should have spent more time building; I'm trying to decide what I can or should do about it at this point. Wednesday, Dec. 18: Run, 0:57, 5.7 miles, 622 feet climbing. Average pace 10:10 min/mile. Thursday, Dec. 19: Road bike, 2:44, 33.9 miles, 3,281 feet climbing. Highway 9 to Page Mill Loop. As usual for a winter afternoon, the well-shaded Page Mill descent was frigid. More frigid than Alaska? Maybe. Friday, Dec. 20: Run, 1:02, 6.2 miles, 980 feet climbing. Average pace 10:12 min/mile. Saturday, Dec. 21: Zero. Travel day to Fairbanks. Sunday, Dec. 22: Sled-drag, 3:34, 10 miles, 83 feet climbing. Mushing trails in Fairbanks, temperature 11F. About six inches of fresh powder. Average pace 21:53 min/mile. Let the real training begin! Oh yeah, I'm attached to this thing. Monday, Dec. 23: Sled-drag, 1:55, 5.5 miles, 53 feet climbing. 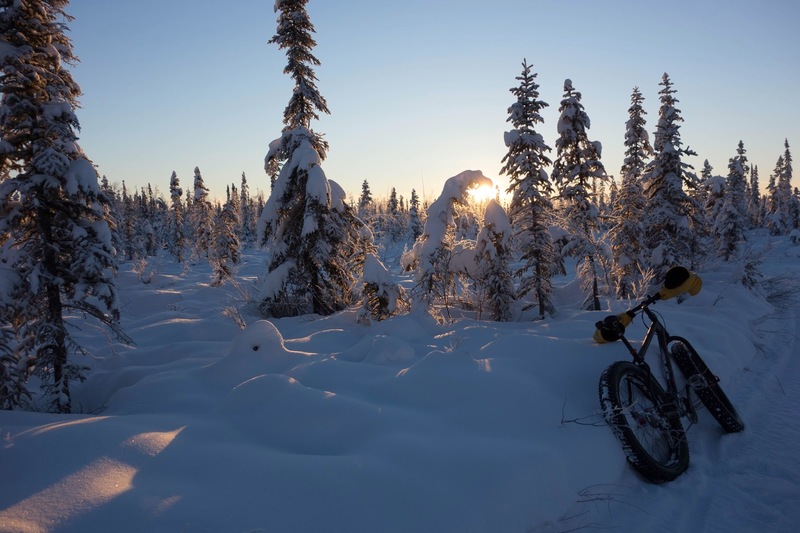 Mushing trails in Fairbanks. Temperature -16. Average pace 21:13 min/mile. By the second day I was beginning to feel some strain in my hamstrings. Some shoulder soreness, but if I adjusted the straps on my harness often enough, the variability was enough to reduce strain on any particular spot, and back soreness was minimal. I decided that minute for minute, hiking while towing a loaded sled through soft snow is at least as hard as running steep trails uphill. And it's even slower. Without downhill relief. This is beyond intimidating, but I'm going to try not to dwell on it. Tuesday, Dec. 24: Sled-drag, 3:11, 9 miles, 259 feet climbing. Goldstream Valley. Temperature -34. 21 min/mile. Some packed trail and some soft snow. When it's this cold, any physical strains definitely take a back seat to survival instincts regarding staying warm. Had no physical issues and felt comfortable. Even still, even the slightest pauses during the effort sparked awareness of the deep cold settling around me, similar I think to the awareness of an ocean diver acknowledging that he's a long way under water. Wednesday, Dec. 25: Sled-drag, 4:15, 10.8 miles, 1,509 feet climbing. Hike in to Tolovana Hot Springs. Temperature -15 to -20. 24 min/mile. I became quite overheated on the climb up the Tolovana Hot Springs Dome, which was strange given the low temperature, and my efforts to vent resulted in semi-frozen small body parts (ears, eyebrows froze without a hat, and shoulders became cold with only the base layer.) Bundled up again for the wind blast at the summit. Figuring out heat and moisture management is a big challenge. Thursday, Dec. 26: Sled-drag, 3:12, 7.2 miles, 1,560 feet climbing. Day hike with fully loaded sleds, a climb to the gale. Temperature -25, wind chill likely -55. 27 min/mile, ouch. Once again I felt overheated and vented heavily on the climb, then was reduced to panic dressing into a shell, mittens, and goggles at the wind-blasted top. Valuable lessons were learned. Friday, Dec. 27: Sled-drag, 4:50, 11 miles, 2,603 feet climbing. Tolovana out. Temperature -25, similar wind chill. Lots of fresh drift over the trail, some knee-deep postholing. Also 27-28 min/mile. Hard work day physically — for me the toughest of the trip, especially the final climb. Steep climbing + wind-drifted snow + loaded sled = Something more strenuous than anything I do at home. Probably no way to effectively train for this. 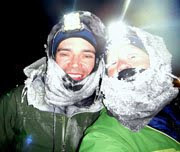 Saturday, Dec. 28: Sled-drag, 6:15, 19 miles, 1,539 feet climbing. Borealis in. Temperature -3, hot! Without the windchill it really did feel 50 degrees warmer than it had at Tolovana. The Monkey Fleece might be too warm at times, so I plan to take two interchangeable mid-layers. 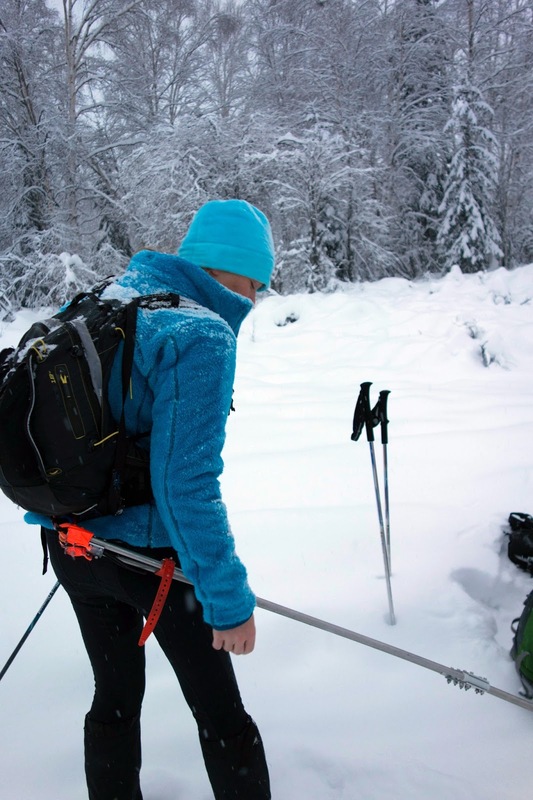 The Patagonia Nano-Puff or NF ThermoBall jacket should work well when it's warmer but not base-layer-only warm. Both seem to be large enough to wear over my Monkey Fleece for deeper cold with no wind, but I'll have to do some more testing. I worked quite hard on this hike, heart rate was likely 140-165 the entire time, which is 50K pace, for six hours, so effectively a 50K effort. 19:45 min/mile. Better. Sunday, Dec. 29: Sled-drag, 4:10, 11.1 miles, 376 feet climbing. Day hike with fully loaded sleds, temperature -25. Soft snow, felt good, worked hard. 22:40 min/mile. Tuesday, Dec. 31: Snow bike, 2:25, 13.7 miles, 154 feet climbing. Borrowed a Salsa Mukluk and took it out for a New Year's Eve joy ride on the mushing trails. Temps around -10, possibly -15 at the lower areas. I thought this would be an easy spin; I was wrong! Trails were decently packed but for various reasons the resistance was set to 10 — I even let a bit of air out of the tires and this only made the riding slower. I tried to make up for it and ended up expending a huge amount of effort and getting soaked in sweat, which I deemed acceptable because I was close to "home." I met Liehann and Beat out snowshoeing about a mile from Joel's house, and traded tools with Liehann so he could try the snow bike. The short hike back to Joel's house was very uncomfortable; I was surprised how quickly I cooled down and only very slowly got my core temp to climb back up as we tromped through shin-deep powder. Anyway, it was another valuable lesson in "Don't get sweaty, no matter what." Wednesday, Jan. 1: Zero. Travel day back to California. An overnight work session on Monday followed by a red-eye flight on Tuesday left me feeling completely empty on Wednesday, with something similar to jet lag. It was good to take a rest day after such a big week, and in truth I was pretty much nonfunctional. Thursday, Jan. 2: Road bike, 1:30, 17.5 miles, 2,739 feet climbing. Mellow ride up Montebello. Legs did feel sluggish and hamstrings still tight. Funny, because I thought my hips and ankles would give me more issues during the sled-dragging sessions, but this time it was my hammies. Need to work on those. Friday, Jan. 3: Run, 1:03, 6.2 miles, 995 feet climbing. Wildcat loop, 10:14 min/mile. I didn't feel awesome on this run thanks to the heat. It always takes time to re-acclimate after time spent in winter conditions, and even 60 degrees feels mid-summer oppressive right at first. When I set out in the early afternoon, it was 62 degrees — although still fairly cool in the shade, and it had been in the high 40s earlier that morning. As I ran up the hill feeling like I might collapse with overheating, I passed a hiker coming down who was wearing a full winter shell, hood up, and cotton mittens. I am not joking — this really happened. It provided some perspective and comic relief. Ah, California. It's good to be back. Saturday, Jan. 4: Run, 2:20, 13.2 miles, 2,180 feet climbing. 10:37 min/mile. Ran the main Rancho loop with Beat and Liehann. I did the entire route from my house which just happens to be a half marathon distance. For the first three miles or so I felt overheated, but then we started climbing the shaded PG&E trail, and suddenly I felt like I was floating. Running is effortless with no sled! I felt like I could just go bounding up the steep hill, but restrained myself to my usual shuffle, although for the first time in a while I didn't walk any of the climb. I also descended slower than usual, not wanting to exacerbate any of my still-tight leg muscles and possibly tear something. But, wow. I did hold back, but as it was, this run felt surprisingly easy, which was eye-opening in its own regard. I have to accept that trail running, even hilly trail running, is for the most part inadequate training for the Iditarod. Which is a shame, because I really enjoy hilly trail running. I gave some more thought to dragging a tire, but to be honest I don't think I can go through with it. Not only would I be creating an annoying obstruction on trails, but I'd have to field endless questions about it. I'm considering preparing a 25-pound backpack to run with. But it is a question of how much stronger I can even get in the next six weeks, and the answer is, probably not much. I might just end up risking injury in a workout that's still fairly nonspecific to what I'll actually be doing in Alaska. We'll see. Steven's Creek Reservoir, now almost entirely dry. Sunday, Jan. 5: Mountain bike, 3:45, 30.7 miles, 4,040 feet climbing. So, training here is not that effective. Oh well. At least it can be fun! It had been a while, way too long, since I went mountain biking. I rode trails in Steven's Creek Canyon and along Skyline Ridge, which were in surprisingly decent shape considering it still hasn't rained. Personally I am disturbed by the lack of rain and deepening California drought. If it doesn't start raining soon, the hills may not green up at all this year, along with all of the troubling climate and water resource concerns therein. Knowing California, we'll probably just demand to start siphoning more water from the Rockies and Oregon. Sigh. But that's off topic for a training log. I enjoyed this ride and do need to build a base for summer, so I'll continue incorporating mountain biking into my routine. No way, you're not getting our water! Actually we are in a drought here too. Pretty bare snowpack. It scares me too. First: I love reading your descriptions / comments about your workouts or your slogs through the Alaskan wilderness. You write quite well. 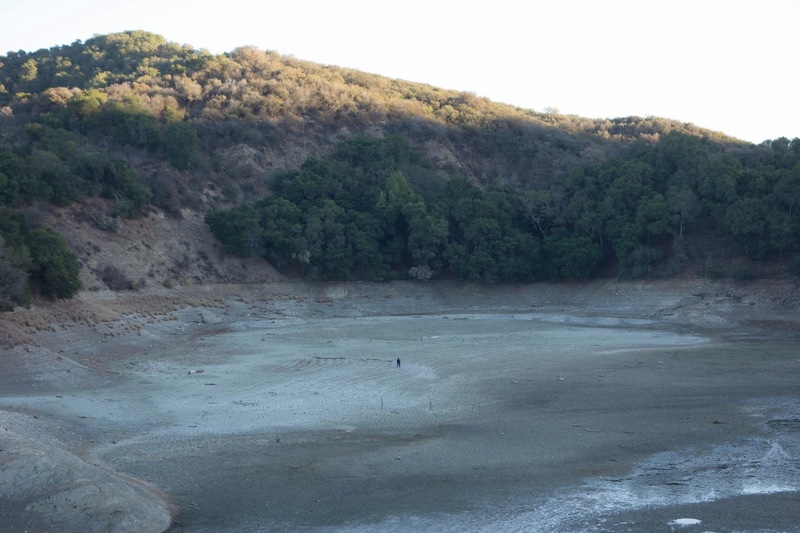 Second: I can't believe that the Stevens Creek Reservoir is almost dry. I used to ride by that every few days when I'd take the long way to work on my bike when I lived in Campbell. I'd never seen it anywhere near that low. wow. Thanks for writing, It makes for great reading. Fortunatley, they bank water around here, from previous wet years, into the underground aquifers. But Back in the 70's, there was a 7 year drought here in the SF Bay area. There was water rationing, barrels under roof downspouts, no watering lawns, ect. Marin county ran out of water since they only get their water from their reservours. They had to run a pipelin efrom the East bay across the San Rafel bridge.